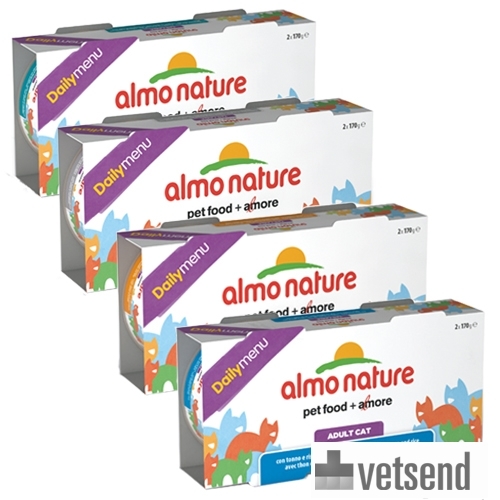 Almo Nature Daily Menu 2x170g Adult Cat Food is a pate for cats that consists of natural ingredients. Almo Nature offers Daily Menu 2x170g Adult Cat food for adult cats. These tasty canned pates are made from the finest natural ingredients. The fish is caught fresh from the sea (not farmed) and the meat is free range, i.e. no hormones or antibiotics are used during breeding. The meat and fish are cooked and processed without chemical treatment and preserved in their own cooking juices so that the natural levels of nutrition and flavour are maintained in the meat or fish. In addition to the natural ingredients, the Daily Menu Pate from Almo Nature features the addition of vitamins to meet the nutritional needs of cats. This makes these pates natural, tasty and healthy for your cat. Some products that used to be under the Classic range have now been moved to the Legend name. However, this transition is not yet fully completed in all countries. As a result you may get an Almo Nature product in the old packaging. Daily Menu is available in 12 clusters of 2 cans of 170 grams and is available in 4 different flavours. Have you used Almo Nature - Daily Menu 2 x 170g - Cat food before? Let us know what you think about this product.